Want to go to a performance, but not sure you want to commit to several hours of the same thing? 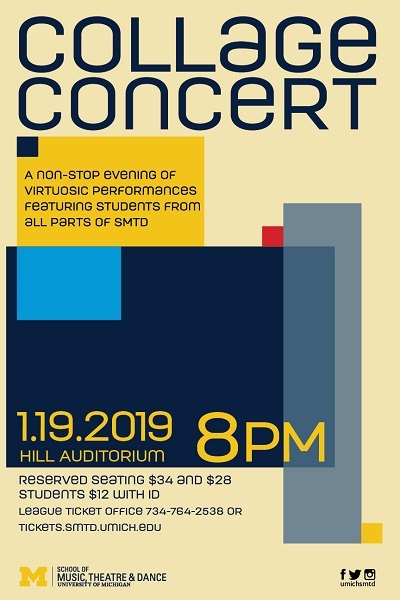 Join the School of Music, Theatre & Dance for the annual Collage Concert, which will take place on Saturday, January 19 at 8 pm in Hill Auditorium. “The event’s design is unique, featuring all ensembles and departments of the School performing one arresting work after another in rapid-fire order.” This means that you can expect to experience some amazing performances of classical music, jazz, theater, musical theater, vocal music, dance, and more. Don’t miss this SMTD tradition. Tickets may be purchased online, or at the Michigan League Ticket Office (open 10am – 1pm on Saturdays). Seating is reserved, and tickets are just $12 for students, or $34 or $28 for non-students, depending seat location.